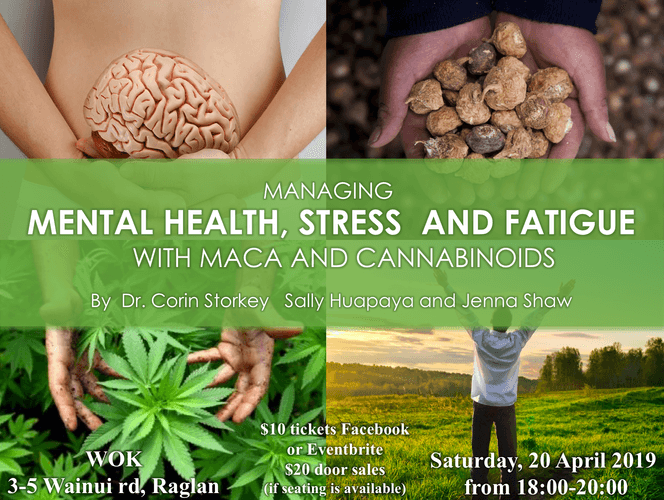 Managing Mental Health and Fatigue With Maca & Cannabinoids may be the upcoming event you’re looking for. Come and learn about how stress impacts our brain and natural plant-based ways to manage it. Stress, trauma, poor diet and lifestyle all play a big role in upsetting the sensitive balance of our brain chemistry and can cause anxiety, depression, fatigue and other symptoms that can lead to long-term chronic illness. During this workshop we will take you through the complexities of how stress impacts on the balance in our body and brain and how our natural health systems try to respond to stressors to maintain balance. We will also be talking about the role of the endocannabinoid system in regulating and balancing our brain and body. How to activate our endocannabinoid system and the different ways we can treat chronic conditions like anxiety, depression, chronic fatigue, auto-immunity and others using Peruvian Maca and cannabinoids (including CBD and cannabis). Corin is a health educator with over 15 years of academic and research experience, specialising in medicinal antioxidant chemistry, oxidative diseases, cellular protection and health. He holds a PhD in medicinal chemistry from the University of Melbourne, Australia and the Heart Research Institute – Sydney, Australia. He has previously struggled with and overcome chronic fatigue syndrome (CFS). Sally is a native Peruvian of Incan descent, with a Bachelor in industrial engineering and specialist in traditional health enhancing Peruvian botanicals. She is an educator of traditional and spiritual practices surrounding Incan medicine and culture. Jenna is a birth doula and anam cara ("soul friend") who helps people having intense experiences to turn their trauma, pain and fear into truth, power & love. With a background in communication, emotional intelligence, spirituality and energy work she offers opportunities to discover and do the deep soul work needed to heal ourselves and the planet. $10 tickets via Facebook or Eventbrite. $20 door sales (if seating is available).